Imagine the North American Indians as astronomers carefully watching the heavens, charting the sun through the seasons, or counting the sunrises between successive lumar phases. Then imagine them establishing observational sites and codified systems to pass their knowledge down through the centuries and continually refine it. Living the Sky describes the exciting archaeoastronomical discoveries in the United States in recent decades. Using history, science, and direct observation, Ray A. Williamson transports the reader into the sky world of the Indians. 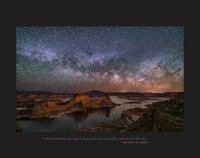 "In the United Staes, a great many of the best places to see the night sky in its full glory, especially its crown jewel the Mikly Way, are found on our public lands of the American Southwest. Above our National Parks and Monuments, above our National Recreation and Conservations Areas, above most of the wild places and open spaces far from cities and large urban areas, the sky is dark and the stars are so abundant than they can be overwhelming". Christopher K. Eaton is a photographer, writer, and filmmaker, living and working on the Colorado Plateau. In the fall of 2017 Chris was an Artist in Residence at Mesa Verde National Park where he captured stunning images of Ancestral Puebloan dwellings bathed by the ancient light of distant stars. 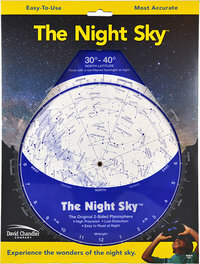 This is the full-sized version of The Night Sky suitable for the 30°-40° latitude zone (southern half of the US, North Africa, Middle East, etc.). 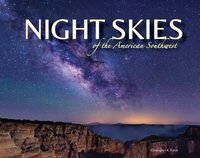 Sharing the Skies provides a look at traditional Navajo astronomy, including their constellations and the unique way in which Navajo people view the cosmos and their place within it. 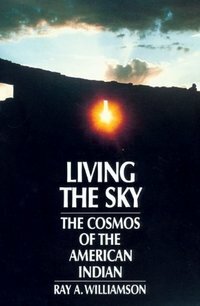 In addition, this book offers a comparison of the Navajo astronomy with the Greek (Western) perceptions. Beautifully illustrated with original paintings from a Navajo artist and scientifically enhanced with NASA photography.